This entry was posted in Switzerland Immigration and tagged Migrate to Switzerland Move to switzerland Switzerland work permit on November 25, 2016 by Blog Author. The number of non-European Union workers permitted to enter countries has been reduced by the nations across Europe, which includes the United Kingdom and the United States. Switzerland Immigration plans to additionally grant 1000 work permits for the non-EU immigrants in the year 2017. 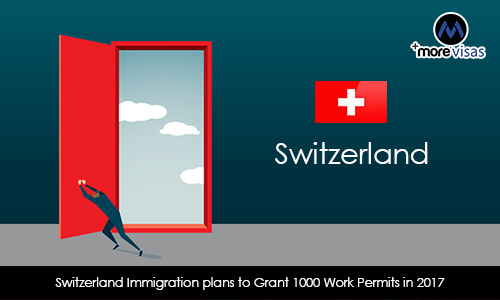 The business houses which are more dependent on foreign staff, appreciated the immigration of Switzerland as they announced that they would be issuing B and L permits to the highly-qualified non-EU workers. Currently, there is a huge shortage of workers in major fields such as IT and pharmaceuticals. Even though 1000 work permits may not be sufficient to overcome the shortage but it may fulfill some requirement. During 2015, Geneva utilized the unused work permits from 2014 held in a federal reserve to top up work permit quota which got exhausted by August 2016. Due to the work permit shortage in Geneva and other cities, some international companies are moving out of Switzerland. The Switzerland government has reduced the number of non-EU (B and L) permits from 8500 to 6500 by agreeing on anti-immigration rules in 2014 and currently this favors the Swiss workers over EU immigrants. Switzerland Immigration announcement of granting 1000 work permits in 2017 might solve at least some percentage of skills shortage to stop the companies moving out of this Swiss space.